Ed is the owner and Optician of McLoughlin Family Eyecare. Originally from Brooklyn, the Mcloughlin's moved to MA and purchased our sister store, The Newburyport Optique, in October of 2001. Since then, Ed has watched his dream of caring for people's eyes brighten, opening McLoughlin Eyecare in 2003 . In his spare time, Ed is, above all, a family man. He has embraced a second career as an indoor cycle instructor, and is an avid runner. Ilara has over 20 years of experience in optometry. She graduated from the PA College of Optometry and completed a residency with local MD's in a busy practice (including a retinal specialist and a cataract surgeon). 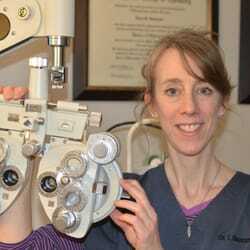 In addition, she was an Associates Professor at New England College of Optometry. Dr. Donarum is passionate about serving the underserved. She has participated in missions to Mexico providing eye exams and glasses to over 2,000 in need. She worked in a clinic that offered in-home eye care to amputees and the disabled. She volunteers her time locally providing vision screening to local schools and for the NH Association for the Blind. Dr. Chin is a graduate of McGill University and he received his Optometry Degree from the New England College of Optometry in 2004, where he graduated with clinical honors and was the local and national recipient of the Alcon Award for Clinical Excellence. Dr. Chin's area of expertise is specialty fit contact lenses, which includes lenses for keratoconus, orthokeratology, gas permeable and soft multi-focal lenses, macro and scleral lenses, contact lenses that are fitted to patients with irregularly shaped corneas and contact lenses fitted to patients post refractive surgery. He also specializes in pre and post refractive surgery management. Dr. Chin is a Clinical and Educational Consultant for Foresight Regulatory Strategies, Inc. and for Vistakon Pharmaceuticals, LLC. Outside of work, Jason enjoys being with his family, fishing, and being outdoors. Alison came to McLoughlin Family Eyecare in 2014 and brings extensive knowledge as a registered Dispensing Optician for over 40 years. During her career she has been in management, lab operations and her favorite-family owned boutiques. The best part of Alison's job is styling patients with eyewear that makes them feel good about themselves. A resident of the Seacoast for most of her life Alison enjoys the beach, spending time with her children ,drawing/painting and rescue animals. Genie joined the McLoughlin team in 2017. She strives to provide the best experience in customer service to each individual patient. When working with Genie to select glasses you're sure to leave with a pair that will heighten your vision needs. Emily has been with McLoughlin Eyecare since 2009, a year after her sister, Colleen. She has since established a strong sense of self, with a genuine interest in caring for patients. Emily is an optical technician certified in ophthalmic lens technology and contact lens fittings. ​When Emily is not working, she is spending time with her husband and family, singing in the Immaculate Conception choir, and creating music. Colleen has been a part of The McLoughlin Eyecare family since 2008. She started out as a receptionist but changed paths to follow her passion as an apprenticing Doctor's technician. Since getting married in 2014, Colleen has started family of her own, her two lovely girls requiring most of her time. ​Colleen is our Oz behind the curtain, and continues to grow and learn working alongside our Doctors.